Two weeks ago we celebrated the feast day for Saint John Paul II. George Weigel wrote an extensive biography of the saint, prior to his death, which the author titled “Witness to Hope.” The life of Karol Wojtyla was just that, and still is, a witness to hope. When we consider the struggles John Paul faced in life and the times where darkness was not only foreboding but encapsulating, he saw a light which led him, drove him and drew him through life. The light, of course, was Christ and in Christ John Paul found his hope. In his youth, John Paul lost his mother and only brother at a young age. As a young man in Poland he, along with his fellow Poles, lived through the invasion and captivity of the Nazi regime. During these years his father died. John Paul lost many friends. He saw several of his Jewish friends hauled off in the Shoah. Hearing the call to the priesthood, he had to respond in secret, risking his life to pursue that call because the Nazis had outlawed seminaries. The communists took over after the Nazis were defeated and the darkness continued. Not too long after he was elected Bishop of Rome he suffered an assassination attempt. Later in life we witnessed his sufferings due to Parkinson’s disease and the once robust and athletic man was crippled by it. Any one of these challenges would tempt one to despair. Not John Paul — he was led by something greater than suffering, something greater than darkness, something greater than evil. He was led by Christ who was his hope. The liturgy for this Sunday reminds us of the hope we have in Christ Jesus. God’s love for us is so strong that he takes on death, destroys its power and frees us for eternal life. In the Gospel passage, the Sadducees approach Jesus with a question regarding life after death. They were probably not sincere in their question since one of the key beliefs of a Sadducee was that there was no resurrection from the dead, as the evangelist notes in the passage. Jesus tells us life will continue after death. His resurrection confirms and accomplishes this promise of life “for those who are deemed worthy.” By these words he urges, encourages and demands faithfulness. God created us in love. He is faithful to us and calls us to faith. This faith underpins our hope. John Paul witnessed this faith and hope. So too the Maccabee brothers whose faithfulness is recalled in the first reading from the Second Book of Maccabees. The brothers are full of hope despite the horrendous times in which they live where the power of evil seems unbridled. Thank you, Msgr. Prior. Sometimes the headlines get discouraging. 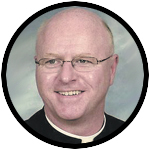 Check Father Steve Katziner’s “This and That” regarding “Forming Intentional Disciples”. Less than 10% of our youth (18-25) attend mass in the U.S. I have 3 grandsons (19 – 24) who no longer attend mass. Their parents are active volunteers at church. It’s upsetting to me and I constantly pray for them.